What’s our role as the worship leader? Only each individual can do that with the Holy Spirit’s enabling. As worship leaders, we must focus on what God calls us to do, but nothing more. No sense in carrying burdens we weren’t intended to carry. There is freedom in knowing and living that, praise God! You can download the rest of Matt‘s document containing these quotes here. He also has other resources available on this page. Hands-down, best ever worship book I’ve ever read. 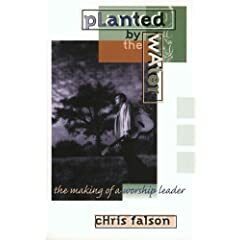 Chris Falson has a way to encourage you that is amazing. I’ve read it backwards and forwards four times. I’ve gone to specific chapters. I keep buying them and giving them away, so I don’t have one now. Practical, hands on help with virtually every aspect of worship leading.